One of the emerging trends in the field of tDCS for medical applications is telemedicine or home use. The main reasons for the field’s growth are that we know this to be a safe technique, with only minor side effects (itching, temporary redness under electrodes after application), and that multiple sessions of tDCS (or tCS, in general) over a course of a few weeks will be needed to effectively rewire the brain. Let me explain. We believe that the effects of tDCS are mediated by the weak electrical currents and associated electric fields delivered to the brain. These fields have the immediate effect of modulating neuronal activity, tweaking the firing rates of neurons. With the right orientation of the electric field, neurons can be made to fire more easily – or the opposite. But what we care about in tDCS is not so much tDCS’s immediate effects, but their long-term consequences. According to our theories of brain function, we are essentially our neuronal connections. We are neuronal networks. What is important is not so much the neurons we have, but how they are wired together. Connections encode proper brain function and memories. When we are affected by a mental condition, it is very likely that the problem can be interpreted as a connectivity problem. This is not too surprising. The brain operates as a complex oscillating network, and one of the key elements that will alter how it operates is the network structure itself [to learn more see this and this]. 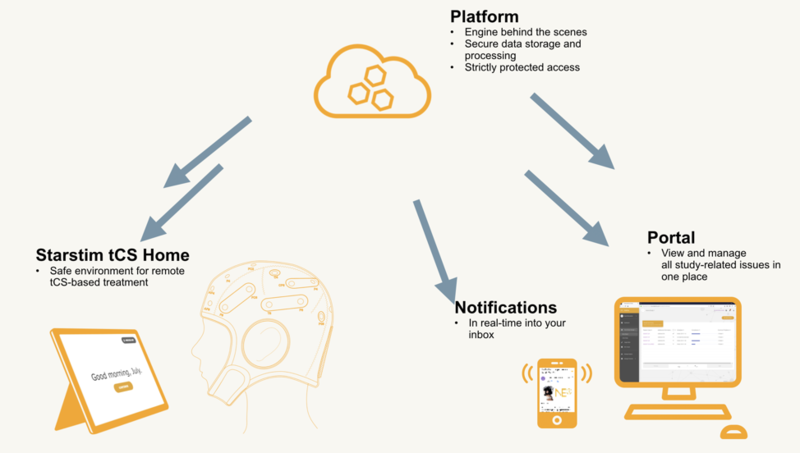 Up to now, the tDCS technology has primarily been used in clinical environments with a large scale set-up that has been cumbersome to use remotely. 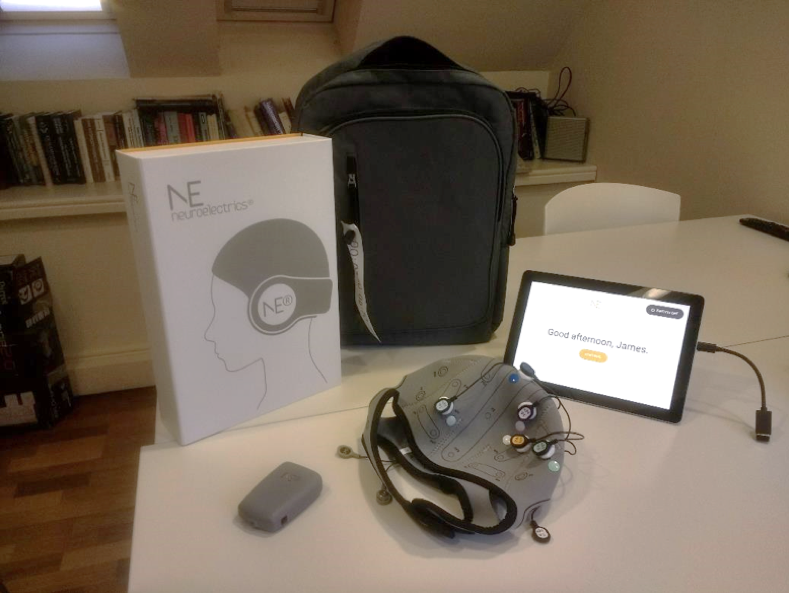 Neuroelectrics has designed the Starstim tCS Home kit in order to make this treatment accessible and easy to use, as we have seen the benefits of being able to take this technology out of the lab. This creates an opportunity to include larger populations in the treatments, including people with disabilities and from rural areas unable to reach the hospital every day. Starstim tCS Home is now available and approved in Canada and other countries for use in treating chronic pain, depression, and addictive disorders. The system utilizes the company’s industry-leading Starstim™ system. It follows accessibility and telecommunication security standards, and applies strict controls on access and hardware checks. Designed for user-friendliness and safety, the Home kits can be used for the treatment of patients or in blinded clinical studies. 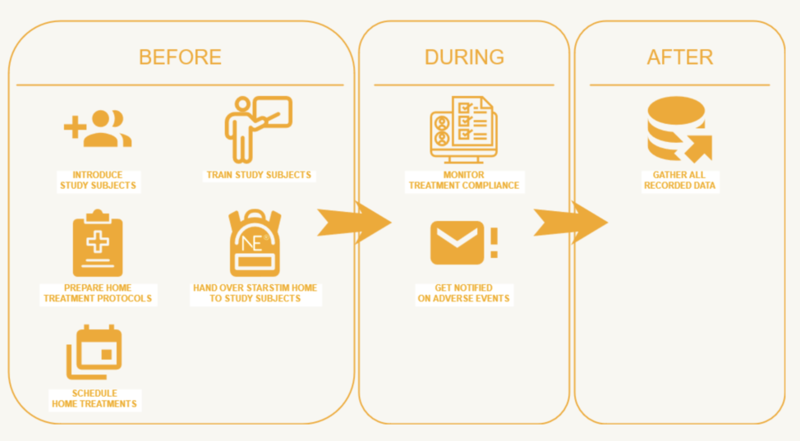 To begin the treatment, a patient receives a personalized and ready-to-use kit at home. It consists of a stimulator device and a neoprene headcap fitted on the head with small electrodes which lie on the scalp and deliver weak electrical currents to targeted brain regions. The kit is complimented with a user-friendly interface on a tablet which guides the patient and family carers through the treatment and allows real-time remote supervision by the physician or clinical researcher. Neuroelectrics cloud workflow: for deployment and operation of cloud solution for Home Studies. 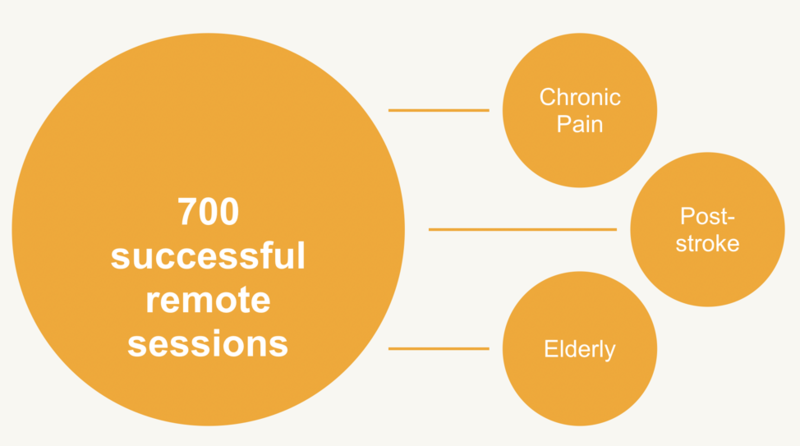 Starstim tCS Home has been used for clinical research and treatment across the US, Europe, and South Korea with over 700 successful remote sessions so far (see Figure 2). Based on experiences from our users, home-based tDCS appears to be feasible and safe. Recent abstracts have been published using the Starstim home solution, which we briefly review. In one abstract  that was presented by researchers at the Neurological Hospital of Lyon, France, six younger adults with chronic pain completed a 4-week, 20-session home-based tDCS intervention. tDCS was self-administered by the patient and remotely monitored by study personnel using the Starstim tCS Home kit. All six participants completed at least 80% of scheduled tDCS sessions. No technical problems were reported during the set-up or delivery of tDCS, aside from a few reports of interruptions in internet connection (note that the system is designed to ensure safety even without any internet connection). No adverse events or unexpected side effects of tDCS were reported. This publication is an early result from a large ongoing study (N=45, 2015-2020) being carried out by the same team, where the Starstim internet-based system is used for tDCS over the motor cortex transcranial at-home, under hospital control. Selection criteria included probable or definite unilateral neuropathic pain, refractory to standard-of-care pharmacotherapy during at least 1 year, and good-to-acceptable responses to a previous hospital tDCS trial. After a 5-day period of training at the hospital, each patient is allotted a password-protected tablet computer connected to a dedicated server, which they use to for daily 20-minute tDCS sessions during one month. Each 20-minute session is validated by hospital personnel, who also controls via the internet that stimulation was correctly performed. Stay tuned for forthcoming publications stemming from this pioneering study. In another study that was presented by researchers at the Guttman Institute in Barcelona , eight patients with chronic pain first received 20 minutes of self-administered tDCS with the Starstim Home Kit in the research laboratory. They were trained in the use of the system and were then asked to complete daily 20-minute sessions of tDCS for the next 30 consecutive days. Again, all participants completed at least 80% of scheduled tDCS sessions. Participants reported no adverse events and 97% of sessions were fully completed without interruption. In a home pilot study conducted by researchers from the University of Minnesota , six participants with hemiplegia post-stroke [mean (SD) age was 61 (10) years; 3 women; mean (SD) time post-stroke was 5.5 (6.5) years] received five 20-min tDCS sessions using the Starstim tCS Home kit and finger tracking training. Participants completed all treatment sessions with no adverse events. Also, 83% of participants found the set-up easy, and all were comfortable with the devices. There was 100% adherence to the sessions and all recommended telerehabilitation. Together, data from our collaborators and others using our devices indicate that remotely-monitored, home-based tCS delivered by the Starstim tCS Home kit is feasible, safe, and well-accepted by participants. We look forward to working together with other clinicians to extend the use of this promising line of therapy. Are you doing a Home Study? We would love to hear about it! Also, we have created a tCS Home Study Checklist you can download for free! Garcia-Larrea L, Perchet C, Bradley C, et al. Validation of an ambulatory system for internet-controlled transcranial direct-current stimulation (tDCS) for at home pain relief. Conf Proc 2nd Annual International Brain Stimulation Conference, Barcelona, Spain. 2017. Soler MD, Opisso E, Lopez J, Rodriquez N, Mitja G, Ruffini G. Remotely supervised tDCS-VR home treatment for neuropathic pain. Conf Proc 2nd Annual International Brain Stimulation Conference, Barcelona, Spain. 2017. Van de Winckel, A., Carey, J. R., Bisson, T. A., Hauschildt, E. C., Streib, C. D., & Durfee, W. K. (2018). Home-based transcranial direct current stimulation plus tracking training therapy in people with stroke: an open-label feasibility study. Journal of NeuroEngineering and Rehabilitation, 15(1).